Have you ever had dreams of walking around in a land filled with switches, mounts, AAC apps and devices, and knowledgeable vendors? Just me? Oh. That’s embarrassing. Well, my inner AAC nerd lived out her fantasy at the ATIA convention in Orlando, FL last week. ATIA (Assistive Technology Industry Association) has a yearly convention that extends past our field of Speech Pathology. I was blown away by the lectures, resources, and exhibits. You think you know assistive technology…and then you realize that your knowledge is just the tip of this wonderfully diversified iceberg. You can find handouts from the lectures here. I registered for a one-day pass and spent Thursday, February 1st shuffling between lectures and having some “fan girl” moments (yes, I waved down Karen Erickson, and no, she didn’t have a clue who I was). I scored some fantastic goodies at the exhibit hall, including core boards from CoughDrop, Saltillo, Proloquo2Go, and LAMP Words for Life. 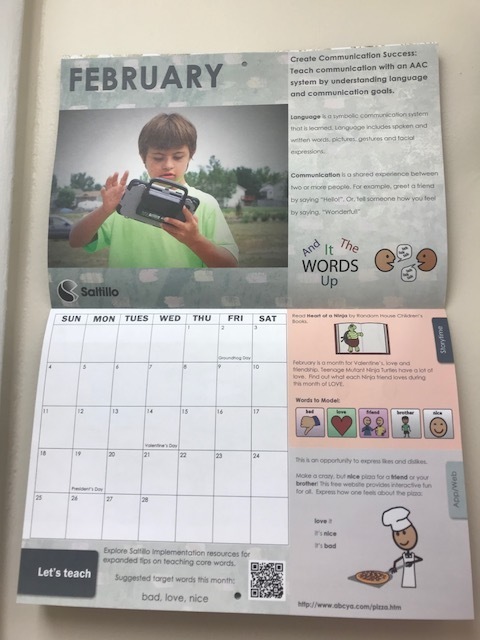 I absolutely loved this calendar from Saltillo, which has activities and core words for each month! It was so much fun to network and meet with AAC Vendors and other professionals who I've been in communication with for close to a year (but never met in person)! That's the thing about this AAC community... we are truly there to support, encourage, and help each other out! Of course I had to make a stop at Carole Zangari and Jennifer O'Brien's poster presentation: "Supporting Improved Literacy Instruction for Individuals with Significant Disabilities". I have been blessed and honored to work with these two knowledgeable and encouraging professionals! 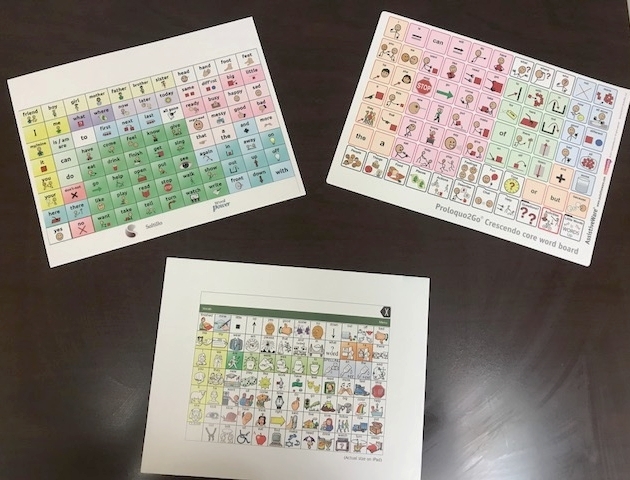 Their presentation delves into a project that used supportive strategies in different stages of face-to-face instruction to increase the quality of teaching literacy skills to individuals with significant disabilities. Pati King-DeBaun's session, "Supportive Reading Strategies for Young Children with Significant Language Impairments" was so informative and answered many of my nagging questions about supporting kiddos in this population. Check out King-DeBaun's resource "My Own Books 2 Go" here. I think this is a resource that many of us have been looking for. It has a plethora of books that are adapted for use online, on iPads, and in printable formats. Whether you're new to the world of AAC or you're a seasoned veteran, there is SO much to learn at the ATIA conference. I highly recommend checking out next year's convention in Orlando, FL, January 30 – February 2, 2019.